a a-suburrits are similar or identical and can be interchanged experimentally with a-subunits of TSH, FSH, or LH. The (i-subunit determines hormonal activity; it is the major immunological determinant and is involved in recognizing a specific binding (receptor) site, a-subunit is involved in penetrating membrane and stimulation of adenylate cyclase. The pS-subunit appears to cover most of the surface of the hormones. FIGURE 5-3 Covalent structure of hGH. Reprinted with permission from Chawla, R. K., Parks, J. S. and Rudman D. (1983). Structural variants of human growth hormone: Biochemical, genetic and clinical aspects. Ann. Rev. Med. 34, 519-547. Copyright © 1983 by Annual Reviews, Inc. Reprinted with permission from Daughaday, W. H. (1995). Growth hormone, insulin-like growth factors, and acromegaly. In "Endocrinology" (L. J. De Groot, ed. ), 3rd ed. Vol. 1 pp. 303-329. W. B. Saunders Co., Philadelphia, PA.
high degree of structural homology between the gonadotropic hormones, LH, FSH, and hCG, and one other anterior pituitary hormone, TSH (see Table 133 and Chapter 5). They all are composed of two nonco-valently linked subunits, designated a and (i. 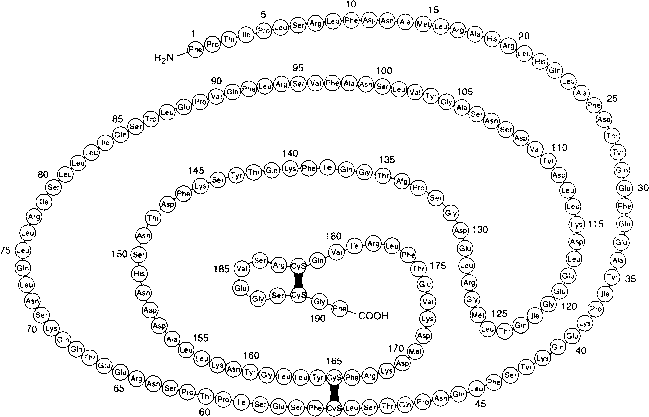 The a-subunits of LH, hCG, TSH, and FSH are of identical structure (MW 13,000). The binding activity of each hormone is determined by the /3-subunit. Each of these four peptide hormones has a significant number of carbohydrate moieties covalently linked to the peptide chain (Figure 5-5B). These relationships are summarized in Table 5-2. Human FSH is a 34,000 molecular weight protein with two subunits consisting of 210 amino acid residues. The a-subunit is common to all three hormones. Each subunit is encoded by a separate gene, each located on separate chromosomes. The /3-subunit gene is drawn in Figure 5-6A. The single-copy gene is 4.9 kb, located on chromosome 1. It has three exons and two introns. The promoter is shown in Figure 5-6B. The start of transcription is defined by the start of the first exon (Figure 5-6A). The TATA box is 29 bp upstream of the start of transcription (Figure 5-6B). Pit-1 is an important transcription factor that binds to the TSH /3-subunit gene between -128 and -58 (Figure 5-6B). FIGURE 5-4 The hematopoietin receptor superfamily. Schematic representations of the structures of all of the known members of the family are shown. Horizontal bars represent conserved cysteine residues. The black boxes represent the conserved Trp-Ser-X-Trp-Ser (WSXWS) motif. 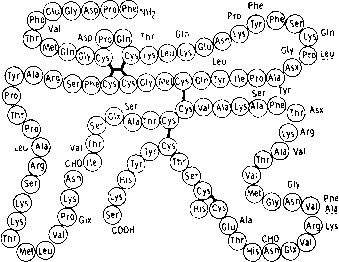 The stippled areas show the stretch of —210 amino acids within which the receptor homologies are contained. The immunoglobulin-like domain at the N-terminus of the IL-6 receptor is also indicated. Reprinted with permission from Casman, D., Lyman, S. D., Idzerda, R. L., et al. (1990). A new cytokine receptor superfamily. Trends Biochem. Sci. 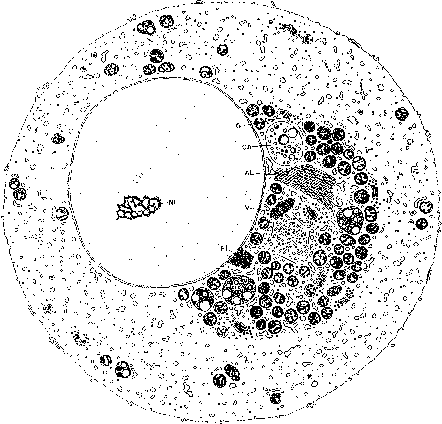 15, 265-270.
has cell-specific regulators of gene expression. In the thyrotrope, expression is dependent on the region -480 to —380, whereas the gonadotropes specify the region —225 to —200 and placental expression depends on the region -200 to about -120. Pit-1 is not as involved in the expression of the a-subunit RNA as it is in the /3-subunit, but except for this piece of information, little is known about transactivators of a-subunit gene expression. TSH is involved in the release of thyroid hormone, as shown in Figure 5-8. In brief, dopamine (DA) drives the release of hypothalamic TRH, which signals the thyrotropic cell of the anterior pituitary to release TSH into the bloodstream. TSH binds to a membrane receptor and affects the release of T3/T4 from the thyroid follicle (Chapter 6). T3/T4 have a negative feedback effect on TSH production and release, in part by signaling the release of somatostatin (SRIH), which down-regulates TSH production. T3 negatively feeds back on the production of the a-subunit and /3-subunit. In hyperthyroidism, the negative effect of T3 is greater for the TSH /3-subunit than for the a-subunit, but in the euthyroid state, both subunits are decreased with a ratio of a//3 of about 1/2. In the hypothyroid state, both subunits are affected although the a-subunit can be inhibited slightly more. The negative feedback effect of T3 is mediated by the T3 receptor binding to the a-subunit gene at -22 to -7 bp (TRE) (Figure 5-7B) and for the /3-subunit gene at about +2 to +10 and about +30 to +37 (Figure 5-6B). Binding of the T3 receptor to this region may interfere with the functioning of the initiation complex since TRE sites are so close to the start of transcription. The final subunit protein products are shown in Figure 5-9.